We all know the old adage about “an apple a day keeps the doctor away”, but what about an apple covered with caramel, chocolate, and decadent toppings like peanuts and sprinkles? Easy – it keeps a smile on all the faces we care about in our lives and is an excellent way to say thank you, just thinking of you, congratulations, and so much more! After months of careful planning, taste-testing, and selecting only the most delicious Gourmet Caramel Apples, we’re so excited to bring our gourmet caramel apples selection to you! We regularly seek out new and scrumptious products for our website that we think loyal customers like you will just adore, at prices you’ll love, too. Let’s explore our new gourmet caramel apples collection, at prices so delicious that even teachers give them an A+! Searching for a cute gift to thank a teacher for his or her hard work and motivation, a co-worker for a job well-done, or a “just because” gift for a special person in your life who needs a smile? We’re proud to bring you our affordable M&M Caramel Apple, Spring Sprinkle Caramel Apple with Peanuts, and our Sweetheart Sprinkle Caramel Apple. Go one step up for gifting occasions like thanking a host or hostess, welcoming a couple into their new home, or as part of a new baby or bridal shower gift. Think gourmet caramel apples like our tantalizing Butter Pecan Caramel Apple, Jumbo Cashew Caramel Apple, and our Dirt and Worms Caramel Apple! It really is true that you don’t have to spend a fortune to gift a truly memorable gift. 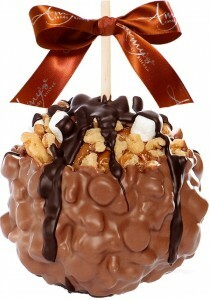 Gift our more deluxe gourmet caramel apples on their own or as part of a larger gift. For weddings or bridesmaid gifts, go for our luxe Oreo Caramel Apple. Meeting the in-laws? Select our Rocky Road Turtle Caramel Apple with Belgian Milk Chocolate to make the right first impression. Saying “I Love You” for the first, or fiftieth time? Feed that love with a Pistachio Turtle Caramel Apple! We’re so pleased to finally debut our Gourmet Caramel Apples! Our team of gifting experts will be regularly reviewing new products, so keep your eyes peeled for even more delicious treats to-come here at Bisket Baskets. Have you enjoyed one (or several!) of our gourmet caramel apples? Leave a comment to tell us how delicious it was! Weddings are a wonderful time, full of happiness for both the couple-to-be and their supportive bridal party. Yet, planning a wedding certainly isn’t easy, especially if you’re working to be as budget-conscious as possible. The last few weeks before the wedding are bound to have their tense moments, but with the right de-stressing techniques, you and your bridal party can relax and enjoy the experience! We’ve chatted with more than a few brides and bridesmaids as they discussed our Bridesmaid Gift Baskets with us, and we heard de-stressing tips ranging from spa days to simply writing a checklist! Tip #1: Jot it all down. Can writing a simple checklist of all that’s left on your plate really help reduce stress? Yes! Rather than worrying yourself trying to remember all those remaining “to-do’s”, jot them down! Sure, you’ll still need to accomplish them, but you’ve got them down on paper and off your mind. Tip #2: Don’t sweat it – sweat together, instead! Don’t sweat the stress – by sweating together! Get your bridesmaids together and go for a run, attend a yoga class, or other group athletic activities. Exercise does wonders on your ability to relax and combat stress, and will also inject happiness boosters into your and your bridal party. We’ve often said how gifting others can not only increase their happiness levels, but can increase yours, as well. We know you’re strapped on time, so take a few minutes to select some of our Bridesmaid Gift Baskets and order them directly to your door – or surprise your bridesmaids by having it arrive at their door! They’ll appreciate the gesture, and you’ll feel happier knowing that you’re showing how thankful you are for their support. Two of our bride-to-be favorites for bridesmaids are our Cosmopolitan Gift Basket filled with “Cosmorita” mix and scrumptious cookies, and our Godiva Coffee Lover Gift Baskets, filled with Godiva coffee, cookies, and delicious cookies. Tip #4: Plan a spa day. Get your bridal party together (hey, even guys like massages!) and book a spa day at a local spa. Many spas will offer a range of different services for your bridal party to choose, along with serving beverages and a light lunch. Check into any available group discounts. Tip #5: Get away for the weekend. In times of stress, it helps to get a little perspective on our lives, and one of the best ways to do that is to remove ourselves from the hustle and bustle of ordinary life. Plan a small weekend getaway with your husband-to-be or with a few bridesmaids. If you can’t afford a weekend getaway right now, plan a weekend “staycation” at home – clear your weekend “to-do” list from Friday night to Sunday night, and fill your weekend with only activities that will relax you.